In a world that is at times confusing and full of change, the wisdom of the Psalms is a timeless anchor that can keep you centered on the Word of God. With Inkspirations Pocket Psalms, you can take God's wisdom wherever life takes you for creative coloring and reflection on the go. Each psalm is paired with stunning original artwork from Kristin van Lieshout, bringing timeless truths in full color on every page on a wide range of life issues, including finding faith through adversity, having patience in God's timing, family, friends and more. Bound at the top instead of the left, this is perfect for anyone whether they are right- or left-handed. "This is the day the LORD has made; let us rejoice and be glad in it." --Psalm 118:24 With Inkspirations Pocket Psalms, you can draw closer to your Ultimate Source of inspiration, power, and joy wherever you are. Each day is a gift from God, a blank canvas on which to begin anew. But as we greet each day, sometimes it's hard to paint the world with kindness, love, and light when we are faced with darkness and demands. But by taking time for yourself to connect with God, you can renew your spirit and find balance in an ever-changing world. It is our hope that as you use your creative gifts to bring the art to life on these pages, you will feel inspired and renewed, and that the timeless truths of the Psalms will be comforting guideposts wherever your path takes you. May your days be filled with many colorful blessings! Oh sing to the Lord a new song; sing to the Lord, all the earth! Sing to the Lord, bless His name; tell of His salvation from day to day. For He will command his angels to protect you in all your ways. ©2017 HCI Books. All rights reserved. 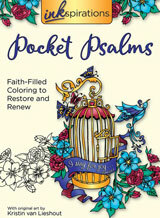 Reprinted from Inkspirations Pocket Psalms: Faith-Filled Coloring to Restore and Renew. No part of this publication may be reproduced, stored in a retrieval system or transmitted in any form or by any means, without the written permission of the publisher. Publisher: Health Communications, Inc., 3201 SW 15th Street, Deerfield Beach, FL 33442.